In honor of summer finally being upon us, I thought it would be fun to highlight a good beach read on Saturdays until we hit autumn. So with that thought in mind I have created "Summer Read Saturday". 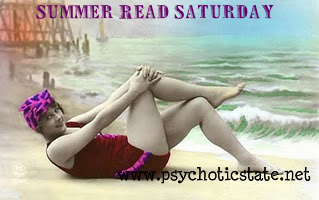 Please join in by commenting on this post or sharing your own Summer Read Saturday post by using the link below. Grab the button above or on the left sidebar to share. So grab your suit, your towel and good sunscreen nd let's see what's in the beach bag this week! BOOK DESCRIPTION: Amy Spencer is an accidental celebrity. On Monday, she s a normal college student in Michigan. By the end of the week, she s in Hollywood, starring in a TV pilot - as a regular girl from Michigan. It s all fun and games until the show gets picked up and Amy learns the terrible price of stardom - to keep the part she didn t even want at first, she s going to have to get the Hollywood Car Wash to make her more marketable. First, she ll have to lose twenty pounds. She ll also need new teeth, blonder hair, and a megastar boyfriend with a big secret. By changing everything from her weight to her hair to her name, Amy slowly learns that the only way to survive in Hollywood is to lose herself. Inspired by true events, this shockingly accurate novel about the ins and outs of the Hollywood game will leave the reader wondering - who is Star? I originally reviewed this book here. I won't rehash my review exactly but I will tell you why this is my first pick for Summer Read Saturday. If anyone enjoys reading fluff like People, Star or The National Enquirer when you are laying out by the pool or on vacation (or in general - - you know who you are), Hollywood Car Wash is like hitting the tabloid jackpot without worry of a lawsuit and potentially less embarrassing than some of the covers of Star. Hollywood Car Wash is juicy, sinful fun - - an absolute guilty pleasure in every sense of the word. It's easy to pick this book up and lose not only yourself in the story but also track of time. Can it get much better than that? Furthermore, the book is allegedly based on the allegedly contractual relationship of Katie Holmes and Tom Cruise - - again, allegedly. If you enjoy making fun of the Holmes/Cruise fauxmance as much as I do (yes, I'm shameless), Hollywood Car Wash will be right up your alley. Grab a fruity drink (alcohol and umbrella optional) and picture a certain former Dawson's Creek actress as the heroine. Just be sure you don't forget to turn or put the sunscreen on while you're reading about the fictional Star Spencer's transformation and rise to fame. If you'd like to add Hollywood Car Wash to your library, please shop at my Amazon store here. What's your summer read for this week? I love this new feature! My current summer reaed is Suzanne Brockmann's Breaking the Rules - it definitely falls into the guilty pleasures summer read category. I haven't heard of "Breaking the Rules" - - I will have to check it out for those days when I need some guilty pleasure reading! Sounds fun. I just ordered a Josh Henkin (spelled right?) book called Matrimony. I'm reading The Thank You Economy now. Doesn't sound very summery, does it? I'll finish it soon and get onto beachier/more mountain-y reads soon. This book sounds great!! I like this new feature too! I am adding it to my calendar and will plan some summer reads!! I love summer reading - great idea! Sounds like a fun one. Great feature! Hi Bill, that does sound like some serious reading. I haven't heard of The Thank You Economy but it sounds interesting. Lori, I love your new button! Very summery and very cute. I look forward to hearing what you'll be reading this summer. Sheila, Alyssa and Juju, thanks so much for stopping by and posting. I look forward to seeing what you lovely ladies will be reading and reviewing this summer. This sounds great. I love summer reading. I'm afraid I'm not going to have any summery reads on my agenda this year. I'm so behind on review books, I will barely be able to read any of my own books! What a neat feature. Sounds like an interesting book too. And summer really does seem to be on its way at last--which unfortunately means there's tons of yardwork to catch up on. What a cute idea! I'm always interested in a good beach read.